Outfits like this remind me why I was drawn to fashion blogging in the first place. All these pieces are staples in my wardrobe that get a lot of wear but I never would have put them together unless pushed. The resulting outfit was something I loved and felt very comfortable in. Link up your layers below or add your photo to the Flickr group! wow. that bun. elicits jealousy that you might be able to smell from your post there. and I love the family of blues. I absolutely LOVE how two plaid shirts look layered together. I think you can check this off as one of your best outfits eva! Love it all. I'm trying to find a shirt like that! Need to check out the Gap, I guess. You look really....fierce? Is that an appropriate use of the word here? Anyway, you look great, and I love the concept. Great look! I like wearing two button downs in different prints...makes things a bit more fun!! I love the double shirts and your jacket - so cute!!! Thanks for hosting a challenge again. I love them! Lookin good Kayla! Love the double button ups with the mixed prints! I love the bun, and the two prints mixed together...I never would have thought to do that! I went with double button ups too! I love your outfit! I found you through Janssen and Nemesis. Nem encouraged me to participate in the challenge this time because I really loved following it during the 21-Day rendition. I'll see if I can stick with it. Thanks for the inspiration! Love your blog, too. I love this double button up layer that you have today. I am going to try this in the near future. 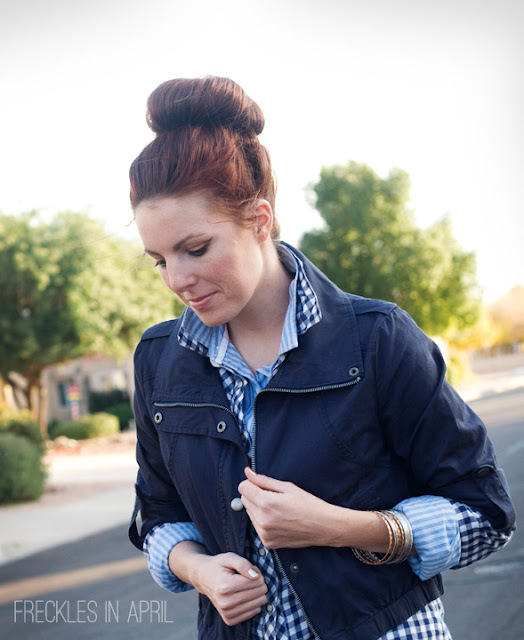 Love love love the jacket with that button down--very edgy yet girly! Thanks for doing this series! I absolutely love it! Great Outfit - I never seem to be able to mix prints successfully, but your outfit makes doing so look effortless. I'm looking forward to the next nine days - this should be so fun to participate in and to see everyone's outfits! Mmmm, everything about this look is lovely. The proportions and cuffs and popped collars are perfection! Nice! This is exactly why I liked doing the 21 Day Challenge. I love how it makes me rethink my closet and inspires me to put together clothes in new ways. Thanks for doing it again! I love the two shirts together-especially with the pattern mixing going on. Also-fabulous bun! Just found your blog!